The Cubs have officially broken the century long curse by taking home the well-deserved title of World Series Champions, and as we Chicagoans ride out the wave of celebration, it seems that winter is rearing her head sooner than we had hoped. The days have become increasingly colder, and snow is already threatening the elusive ten-day forecast here in the Windy City. It seems like just yesterday we were sitting poolside and dreaming of when the persistent heat would let up, and here we are with the heat on full blast, wishing we could rewind and enjoy those dog days of summer with a higher level of appreciation. Alas, the time machine portal to July is out of order, and as the sun sets earlier each day, we can’t help but brace for the impending brutality of winter in Chicago. As dreary as it may seem, winter weather is not the end of the world, especially if you own a capable and dependable Chevrolet. While some of you are cozying up to a warm fireplace this evening, we invite you to consider cozying up to a new-to-you Chevrolet from your top choice of used car dealers in Chicago. The flames in your brick fireplace will eventually cease, leaving you cold and yearning once again for those warm summer days you took for granted. Rather than sulk and stare at a dark and sooty fireplace cavity, consider what a used Chevy model can do for your spirits this holiday season. For centuries, people have been relying on predictions from the Farmer’s Almanac to prepare them for upcoming winter weather conditions and predictions. Based on a 200 century-old formula, the Farmer’s Almanac has predicted that this 2016-2017 Chicago winter will be one with “exceptionally cold conditions,” noting that February will be the worst month for these to occur. With an impressive 80-percent accuracy in its predictions, there is more reason to heed the Farmer’s Almanac warnings than there is to ignore them. The ice cold and frigid winter temperatures expected here in Chicago might have you down, but there are ways to help make the season just a little bit brighter, safer, and more manageable. Imagine sitting inside of a well-equipped pre-owned Chevy model, enjoying the sounds of the season on Chicago’s 24-hour holiday radio station. Just the thought of it is enough to warm your spirit, and it can be much more than an enticing day dream when you come down to Chevrolet of Naperville this winter for a new-to-you car. Reading through pages of Farmer’s Almanac predictions can leave you with a feeling of dread, and may even inspire you to head south this winter. Before you make any major life decisions, consider how a dependable used car can help prepare you for the cold winter season that inevitably lies ahead. When you seek out a high quality used car to help you cope with this winter season, it is important to list out what is most important to you in a new-to-you vehicle. Consult the following list, as you weigh your must-haves and needs for a used car purchase this winter. Capability: For drivers who are less confident on snow and ice covered roads, it is important to consider a vehicle with all-wheel drive or four-wheel drive capability. These two systems will help you stay on your intended path more easily, and will mitigate slipping and sliding on slick roadways. While vehicles equipped with this type of capability tend to be more expensive than front-wheel drive options, spending a little more for enhanced peace of mind is usually more than worth the minimal increase in cost. Interior Comfort: Choosing a used vehicle you find comfortable can be the key to remaining happy with your car purchase for years to come. Whether that means finding a used model with leather heated seating surfaces, power adjustable seats, and an automatic climate control system, or opting for a car with high-tech connectivity solutions and navigation. Every buyer is different, so consider what will make you feel most comfortable and confident behind the wheel before you select a used vehicle. Vehicle Type: While it may seem like a no-brainer, it is important to understand what you will be using your vehicle for in order to choose the right one to buy. 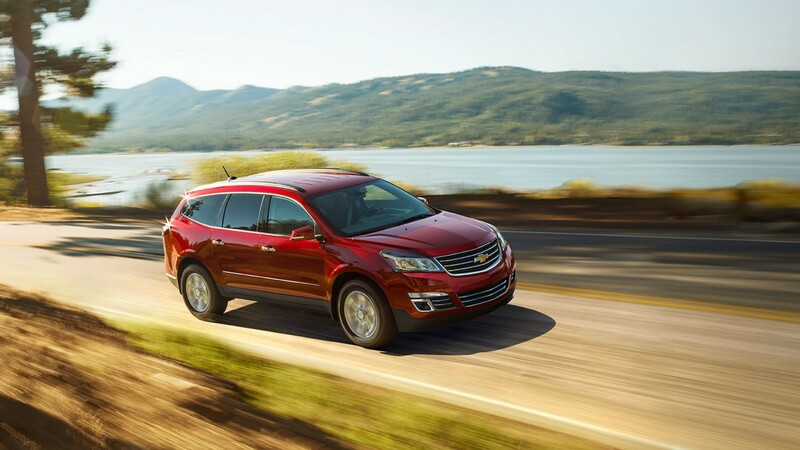 For families on the go, a mid- or full-size SUV is likely a better choice over a subcompact car. While drivers who have an extended daily commute will fare better in a compact sedan compared to a large SUV. Discover what you will be using your vehicle for the most, and make a smart buying decision that will fit into your lifestyle needs. Dependability: Not all used cars are created equal, and this is a definite point to keep in mind as you search for a used car this winter. Chevrolet offers the most awarded lineup of cars, trucks, and SUVs, most of which have been commended for their long-lasting durability and dependability. Buying a used car that has been known to hold its value and be dependable for extended periods of time is the best way to ensure your pre-owned purchase will last you for years down the road. This list is just a starting point for buyers seeking a used vehicle to buy this winter. Chicago will certainly see its fair share of freezing temps, ice, and snow in the coming months, but that doesn’t mean you have to be stuck with a vehicle that you don’t like. At the end of every year, more used vehicles arrive at dealerships across the country, and that is no exception here at Chevrolet of Naperville. With a wide range of high quality used and Certified Pre-Owned Chevrolet models, there is no shortage of vehicle inventory to help you find the perfect car to help turn your dreary winter into a wonderland.